Simple elegance is a good description for this 3/4" thick blue acrylic plaque. A ribbon of gold wraps the top and bottom of the plaque to frame and highlight a large personalization area. A white self adhesive backer shows through to enhance the personalization and allows for either vertical or horizontal hanging. Available in 2 sizes, your recipient will be honored to receive this recognition of accomplishment. This sturdy stand-up is 1-5/8" thick and stands on 2 aluminum feet for stability. It features a unique carbon fiber finish and a clear acrylic that is attached to the stand-up with magnetic standoffs. 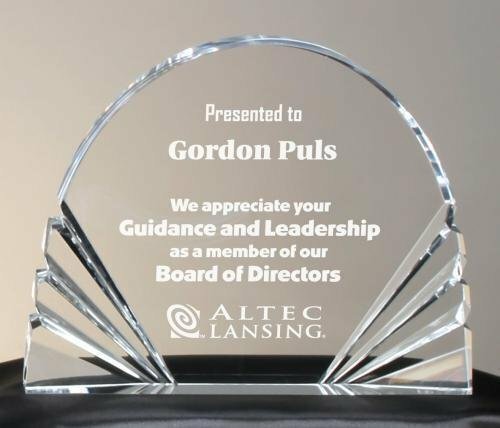 The personalized acrylic appears to "float" in front of the plaque giving it a 3 dimensional look. 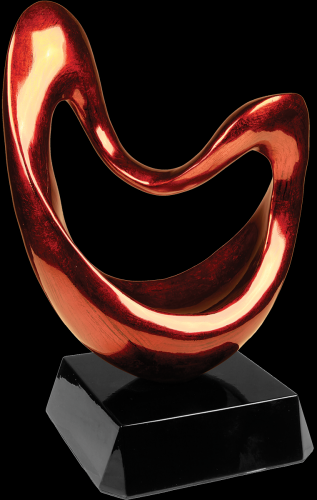 This elegant stand-up is available in 2 sizes to meet your award needs.